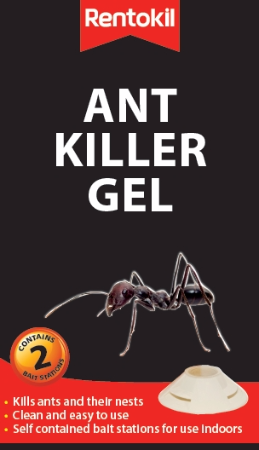 Rentokil Ant Nest Killer Gels offer rapid ant control as they kill contain a gel bait which worker ants take back to the nest, killing off the ant colony. These Ant Nest Killer Gels from market leaders Rentokil are an excellent method of ant control killing both ants and ant colonies. Worker ants are attracted to the insecticidal gel bait and take it back to the nest as food, killing off the queen and so halting reproduction. These Ant Nest Killers are supplied as a twinpack of Gel Bait Stations. Use one twinpack in every affected room, placing one bait station per ant trail at intervals of 3m. Remove the clear lid, and place the bait station on an even surface, ideally along an ant trail, near any obvious entry points or at the entrance to the nest if visible. Press the gel capsule firmly downwards to activate and then replace the lid. For a more comprehensive ant treatment, please see our Ant Control Kit, which contains a variety of ant killer products including Rentokil Ant Nest Killer Gels, Pest Expert Formula 'P' Ant Powder and Formula 'C' Ant Killer Spray.